Login Rewards were added to Legends at the start of October 2017. 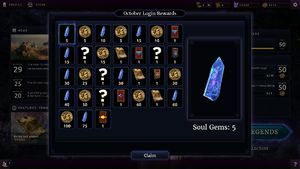 The first time you log in each day, you receive a reward such as card packs, random cards of specific rarities, event tickets, gold, and soul gems. The random card rewards depend on your level. 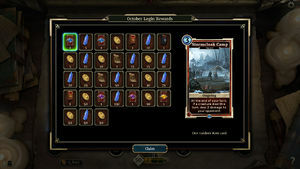 If you are level 50 the cards will be from the latest expansion, and at any lower level they will be from the Core Set. Mystery rewards in the new client will usually be random cards. 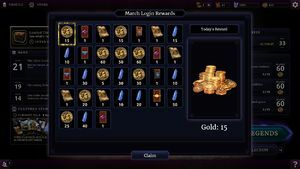 The rewards follow a specific order, which will change each month. Logins do not need to be consecutive: if you log in for the first six days, then skip a day, when you log in on the 8th day you will receive the 7th reward. Note that this means that if you miss logging in for too many days, you may miss the higher-end rewards, as the reward schedule will change with the new month. For instance, Legendary cards usually are placed at the last day of each month, so missing logging in for even a single day will mean you missed it for that month. November 2017 The final two November 2017 rewards (100 soul gems and Legendary card) were switched due to technical difficulties with the servers. This allowed everyone that logged in all other days to still collect the Legendary card. 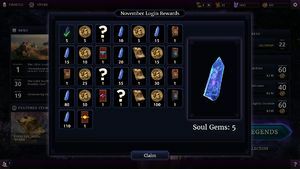 To compensate players that managed to login all days of November, the soul gems on the last day were increased to 400. January 2018 The first two January 2018 rewards were not rewarded due to technical difficulties at the start of the month. Once the issue was resolved, anyone that logged into the game on January 1 or 2, received 5 Gold and 5 Gems, respectively. The first two rewards on January 3 and 4 were increased to 100 soul gems and 100 gold, and the reward calendar was reduced to 29 days so that players who did not manage to log in or receive rewards on the first two days could still receive all rewards. February 2018 February 2018 was the first appearance of "mystery rewards", each of which was an individual alternate-art Grisly Gourmet (do note that they were not playsets, but only one card per day). 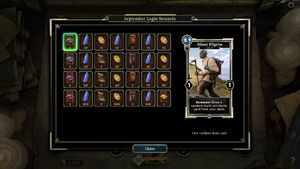 April 2018 Before the Houses of Morrowind expansion was released on April 5, the Login Rewards displayed Heroes of Skyrim card packs. 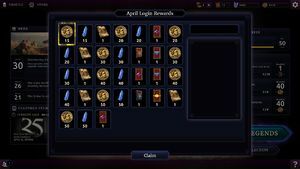 On April 8, the Legendary card and the last Soul Gem reward were switched with each other. May 2018 One mystery reward was scheduled on May 15 which was revealed to be the Scale Card Back. September 2018 Due to technical difficulties there were only 28 rewards this month. 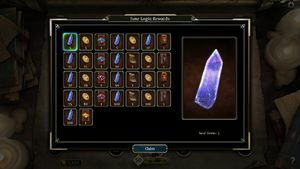 Reward order was slightly altered after the release of the new client. December 2018 The 60 Soul Gems and the Legendary reward were switched on December 11. From now on it is possible to claim the Legendary reward without the requirement to login every day. February 2019 The mystery rewards were removed on February 3. March 2019 There was a reward with 1 which was changed before it could be rewarded. This page was last modified on 1 April 2019, at 11:22.